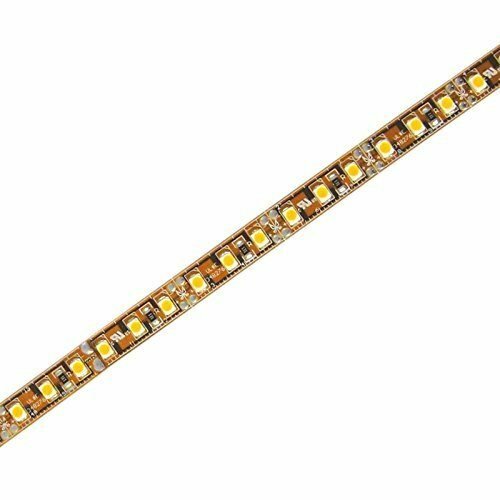 Diode LED DI-0091 BLAZE 5050 SMD 16.4ft Cool White 5000k High performance luxury LED strip BLAZE High Output Strip Light has twice as many LED bulbs as theFLUID VIEW Strip Light, so it offers twice the brightness. It has the same ultra-low profile as the FLUID VIEW strips, which means it will fit in almost any lighting installation. This light is only one third of an inch wide and one tenth of an inch high, and comes with a 3M adhesive backing that ensures easy mounting virtually anywhere. The BLAZE Strip is cuttable every inch. This flat LED strip emits light in a 120° light beam angle. The BLAZE High Output Strip is packed with high power SMD LEDs that combine to make a brighter, cheaper, and warmer light than almost any fluorescent or incandescent fixture. And there’s no scalloping, just a completely even line of light. Although BLAZE strips are twice as bright as standard strips, they use a mere 2.9 Watts of electricity per foot! This strip features LED lights that, unlike halogen fixtures, emit very little heat. The energy efficiency, flexible design, and high intensity of LED strip lighting make it optimal for these home and commercial lighting situations: Kitchen cabinet, under cabinet, shelf, and case lighting Exhibit, presentation, and project lighting Close application task lighting Cove and interior accent lighting Shop windows, window displays, display case lights, and uplighting Light boxes and interior signage Dimmable Length: 16.4 ft. Weight:4 oz. Width: 0.3 in. Height:0.1 in. LEDs per foot:36 LED Spacing:0.3 in. (between centers) Field Cuttable: every 3 LEDs / 1 in. Connectors: 16.4 ft. spools come with 3 ft. bare lead wires on one end and a 12 in. white, female DC plug on the other end; 100 ft. spools come with 3 ft. bare lead wires on both ends LED Bulb Type: 5050 SMD LED LEDs per foot: 36 Beam Angle: 120 degrees IP Rating: IP40 Input Voltage: 12V DC Power Consumption per ft.: 2.9W Color: cool white Color Temp. : 5000k Lumens per ft. If you have any questions about this product by Diode LED, contact us by completing and submitting the form below. If you are looking for a specif part number, please include it with your message.